Love this effect created by a stack of Obama t-shirts. Seen here. One of my favourite photos on the teelover's flickr group. The ultimate t-shirts for "teelovers"
Quoting from the flickr page of photographer Joe Russo: "These are test pics from Geoff Chen's 'Love' photoshoot. He created t-shirts with two neck holes, for a couple to slip into. There was 2 straight couples, a gay couple and a lesbian couple." You can see the rest of the pictures here. Found this on Flickr. 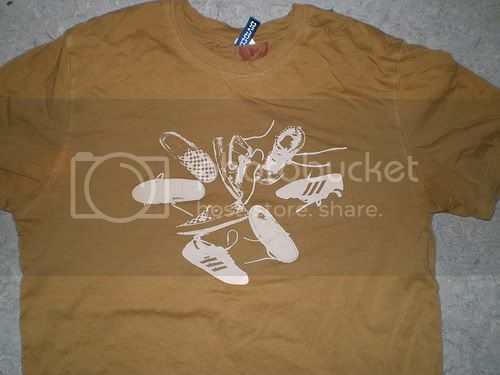 There's a flickr set full of cool t-shirts like this. I like The Trumpness and Dalai Lama. T-shirt from Graniph, found on Flickr. Everyone is invited to join and add their photos, so if you haven't done that already, come on over. Found this screen-printed t-shirt on Flickr. Cool shoes make a t-shirt look cool.